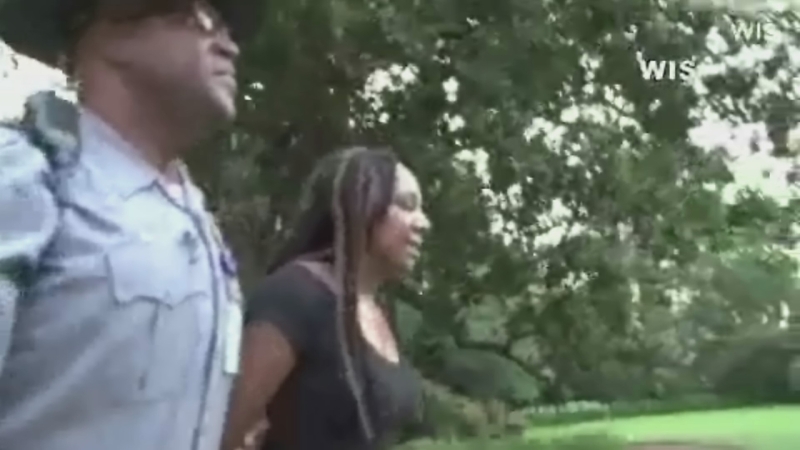 COLUMBIA, SC -- In Columbia, South Carolina, police say two people are in custody after a female activist went up a 30-feet-high flagpole and removed the Confederate flag from in front of the state capitol. The activist, identified as 30-year-old Brittany Ann Byuarim Newsome of Raleigh, NC, was about halfway up the flagpole when State Capitol police told her to come down. Instead, she continued climbing and removed the flag before returning to the ground, local station WIS reports. Newsome and another man, 30-year-old James Ian Tyson of Charlotte, who had entered the wrought-iron fence surrounding the flag were arrested. Newsome said she did it "because it was the right thing to do and it's time for somebody to step up, do the right thing, we have to bury hate, it's killing us literally. We can't do this. We can't be warring with each other all the time. It's not right." Asked why one shouldn't wait for lawmakers vote to take it down, Newsome replied, "What is there to vote on? There's doing the right thing and doing the wrong thing. It's time for the people to have the courage to -- everybody knows what the right thing is to do. We have to step up in love and non-violence. We have to do the right thing or else it won't stop. "Every day that flag flies up there, it is an endorsement of hate," she said. "I prayed on it, and I was very afraid but I wasn't afraid anymore because you know, the lord calls us all to do different things. That's why he me to do this, this is what I'll do." The Confederate flag has not been replaced in front of the state house since the incident. Calls for removing the flag across the nation have been renewed since the Charleston church shooting. CNN reports a rally is reportedly planned for today in Columbia to support taking down the flag for good.